Junior QB Deondre Francois beat out James Blackman and Bailey Hockman for the opportunity to start for FSU in the season opener against Virginia Tech. 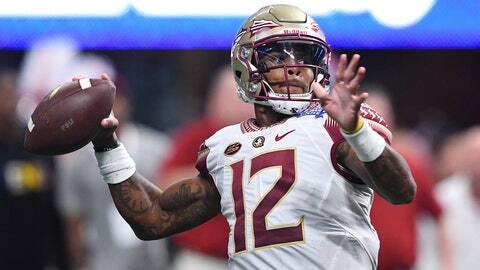 TALLAHASSEE, Fla. (AP) — Deondre Francois is back in the driver’s seat. “In every scrimmage we’ve had, he’s been really impressive,” Taggart said. “And the same thing in practice. And they all have. It’s been a good competition. Francois threw for 3,350 yards, 20 touchdowns and seven interceptions in 2016 when he was named the Atlantic Coast Conference’s rookie of the year. He suffered a season-ending knee injury last year in the Seminoles’ opener against Alabama and had surgery three days later to repair the patellar tendon in his left knee. Francois was limited during spring practices but was cleared for full participation when the Seminoles began preseason practices. Taggart said he informed all three quarterbacks about the decision on Sunday. Blackman had stepped in to start after Francois’ surgery and the competition has been viewed as one of the most important ones of the preseason as well as a major decision for Taggart, who prepares for his first season as Florida State’s coach. Francois was investigated for a pair of off-field incidents and took part in a diversion program for a misdemeanor marijuana charge. He moved back on campus and has strengthened his relationship with teammates. As a true freshman, Blackman threw for 2,230 yards, 19 touchdowns and 11 interceptions. Hockman took a redshirt in 2017, his first year on campus, and often ran the Seminoles’ scout team. Taggart thinks Blackman and Hockman will be ready if called upon. Francois wasn’t made available to the media on Monday but has spoken a few times during the preseason. He said the competition has made each quarterback better. Virginia Tech defensive coordinator Bud Foster said Sunday that he was focusing his preparations on Taggart’s system instead of figuring out who would be the quarterback.